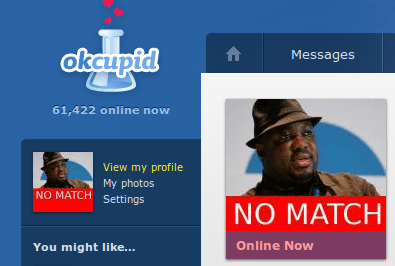 I also wrote a blog on the internal OKCupid blogging system… Not sure if it will get deleted, so I’ll post here too. This is mainly written for the old owners of OKC, not the new ones. So in the mean time, OKC you got me…. But once I find a dating site which isn’t too scared of revealing its data, has great people and frankly a nice attitude I’ll be pushing to take my data (yes mine not yours!) with me to the better dating site. In the meantime, you will have to put up with my mini protest in my profile. “NO MATCH” is a clear sign to say as a user of the site I’m not happy with this sale. I understand it might be a great sale for you guys but the fact you removed your very informative blog post about paid dating sites deeply worries me. You say it will remain free but how long till that promise is also broken? The magic of what made OKcupid is now in the balance and to be fair I think it will be lost forever once Match start laying down demands. Do the loyal community a favour and provide some way to port our data out of OKC. I like many other answered over 700+ questions and spent a lot of time on the site perfecting our profiles. I would hate for that all to be lost. Show us some love OKC.